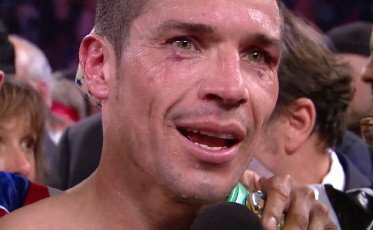 By Marcus Richardson: Sergio Martinez (50-2-2, 28 KO’s) was forced to fight that last eight rounds of his bout with WBC middleweight champion Julio Cesar Chavez Jr. (46-1-1, 32 KO’s) with a broken left hand last Saturday night at the Thomas & Mack Center in Las Vegas, Nevada. Fighting with mostly just his right hand, Martinez was still able to pound out a relatively easy 12 round unanimous decision by the scores 117-110, 118-109, 118-109. For boxing fans who don’t know already, Martinez is left-handed and his left is his bread and butter punch that he uses to knockout most of his opponents. With his left hand badly broken, Martinez was unable to get maximum power on his left hand power shots the way he wanted to against Chavez Jr.
With how easy it was for Chavez Jr. to be hit last Saturday it’s scary to imagine what Martinez would have been able to do to him had he had two good hands instead of just his right. This is why Martinez was forced to jab Chavez Jr. so often in the fight because his left hand was out of commission in terms of power punching. As it turns out the jab was all Martinez needed to do against the near helpless Chavez Jr. It worked out perfectly even without his big left hand working for him. Besides his broken left hand, Martinez also tore ligaments in his right knee when he was knocked down by Chavez Jr. in the 12th round. Martinez also suffered a cut over his left eye. All of these things will keep a rematch between Chavez Jr. and Martinez from taking place until next year sometime at the Cowboys Stadium in Texas. Chavez Jr. might have been in trouble had Martinez not injured his left hand so early in the fight. No wonder Martinez badly wants a rematch with Chavez Jr. He wants to prove that he can knock him out this time with a healthy left hand. Next boxing news: Will Chavez Jr. be the next fighter to dump Roach?